You are here: Home / Breakfast / Halloween Smoothie Bowl – fun pumpkin design! 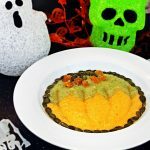 Halloween Smoothie Bowl – fun pumpkin design! 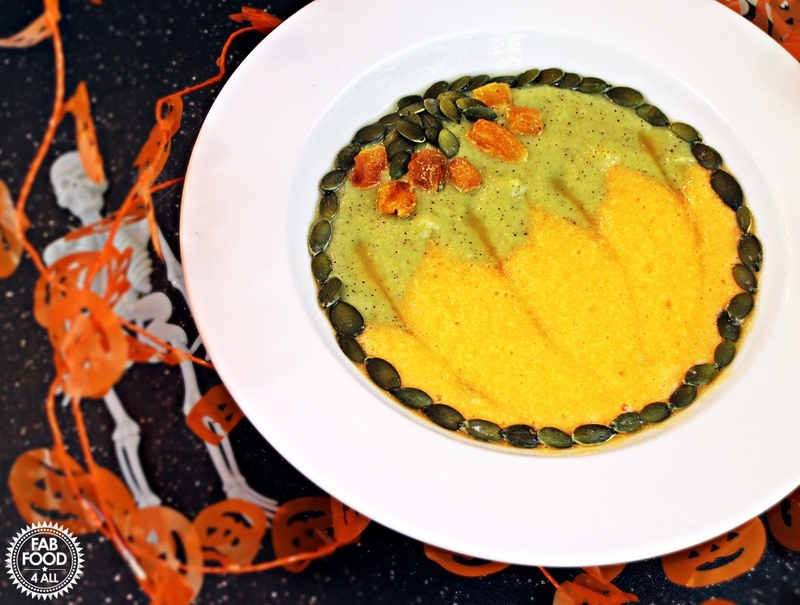 Today I have the pleasure of sharing with you my Halloween Smoothie Bowl! Whether your kids are young or old we all want them to eat a healthy diet and anything that can tempt them to eat fruit and vegetables they might otherwise turn their noses up has to be a good idea. So with Halloween on the horizon I thought a two tone orange and green smoothie in the shape of a pumpkin (yes it’s a pumpkin, humour me) would be a fun way to to get kids (and adults) eating more of their 5-a-day! 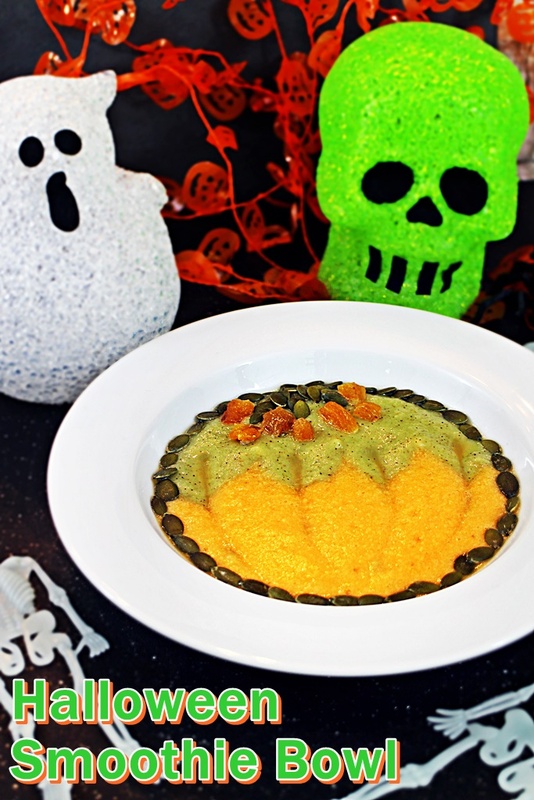 I know if I gave my daughter a bowl of the ingredients of this smoothie then she would leave the kiwi, orange and pineapple but presented as this fun Halloween Smoothie Bowl she polished off the bowl in no time. Hubby also really enjoyed it but my 17 year old son turned his nose up as he just doesn’t like the texture of smoothies. The thing I really like about smoothies is that unlike putting your fruit and veg in a juicer all the fibre is retained which is vital for digestive health and you will also feel fuller. This Halloween Smoothie Bowl contains mainly fruit but there is carrot and cucumber in there too as well as pumpkin seeds and dried apricot (garnish) which are great sources of iron. The pineapple I used was from those handy prepared packed lunch packs which I buy if I find reduced and freeze and the dried apricots and pumpkin seeds were from a bag of mixed fruits and seeds. For those of you who are more artistically gifted than me you could try making your own Halloween picture, spider webs or a giant green spider spring to mind as ideas! Why not get your kids to make and decorate their own Halloween scene in a bowl? We love Halloween here and every year I am amazed by my daughter’s creative make-up and outfits, here brother has of course grown out of Halloween but Coco our black cat likes to join in and follows us as we go Trick or Treating! But just one word of warning for when you go out Trick or Treating with your kids, make sure they stay well away from tea lights in people’s pumpkins on their door steps. We had a near miss one year at one of our neighbours and as so many Halloween outfits are flammable you really do have to be ultra careful! 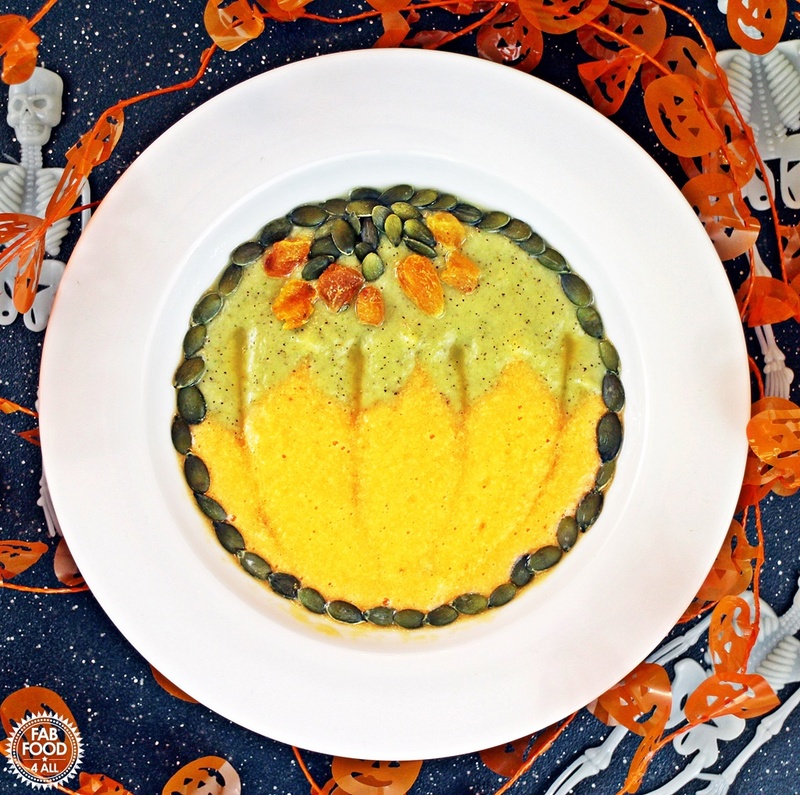 Halloween Smoothie Bowl - fun pumpkin design! This Halloween Smoothie Bowl is packed with delicious pinapple, banana, carrot, orange juice, kiwi, apple and lime juice and topped with pumpkins seeds and dried apricot for a fun healthy treat. Place all the orange layer ingredients (pineapple, carrot, orange juice and banana) into a blender or smoothie maker and blend until smooth. Rinse out the blender and then add the green layer ingredients (kiwis, cucumber, banana, apple and lime juice) and blend until smooth. Place the green smoothie into 2 bowls keeping to one side and then add the orange layer to the other side. Use a chop stick or knife to drag lines into the orange side from the green and vice versa to make a pumpkin pattern. Decorate the pumpkin with pumpkin seeds and apricot pieces. Previous Post: « Oreo Brownies – indulgent and delicious! This sounds lovely, must give it a go.